South Bermondsey railway station is on the Inner South London Line, between London Bridge and Queens Road Peckham. It is served by trains from London Bridge to West Croydon via East Dulwich and Norbury (East Croydon on Sundays) and Beckenham Junction via Crystal Palace as well as trains returning to London Bridge. The original station was situated to the north-west of South Bermondsey Junction, on the northern side of Rotherhithe New Road. It opened on 13 August 1866 with the SOUTH LONDON Line, and was originally named Rotherhithe; it was renamed South Bermondsey on 1 December 1869. It closed on 17 June 1928, when the present station, situated south of South Bermondsey Junction, took its place. The 1928 station is on an embankment, and its platforms and buildings are of wooden construction. After the adjacent New Den Stadium, Millwall F.C. 's home ground, opened in 1993, a direct footpath was built from the station to the ground. Here's the our members favorite photos of "Railway Stations near London Borough of Southwark". 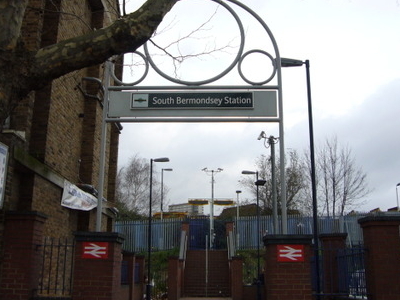 Upload your photo of South Bermondsey Railway Station!